Koyorad’s new “KH Series” radiators feature high density 25mm cores. 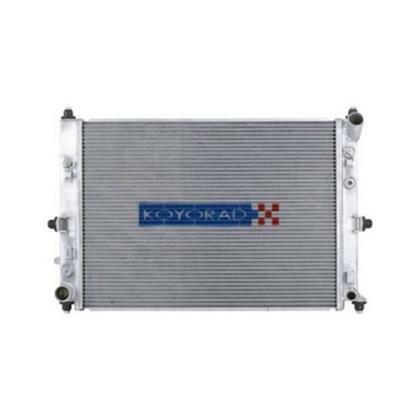 Koyorad’s radiator design and selection of materials results in the most effective and efficient means of heat extraction while also allowing proper air circulation through the engine bay. Koyorad was able to increase coolant volume while keeping overall weight to a minimum. In typical fashion, Koyorad has engineered this radiator with precision, directly replacing the stock OEM plastic/aluminum radiator and will bolt easily to the factory equipped fan shroud for a quick and simple installation. Koyorad’s superior quality, precision hand welds, reliability and uniformity are what have earned Koyorad their excellent reputation in performance cooling worldwide.